With competition from Google’s own People Widget breathing down its neck, startup Rapportive is innovating fast to keep its Gmail plugin in the lead. 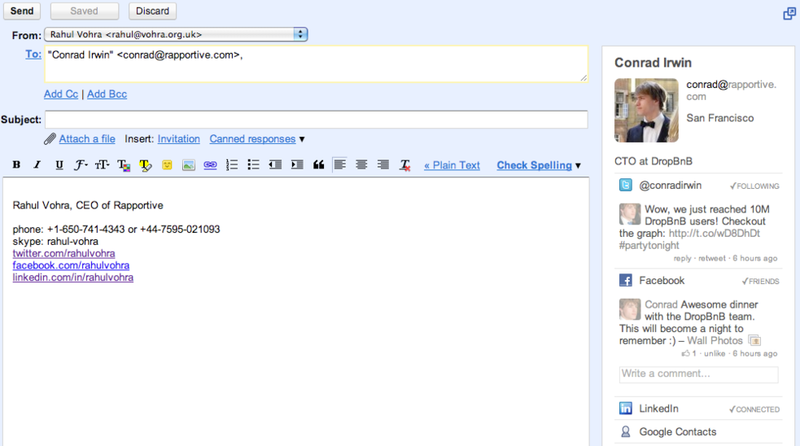 Rapportive replaces the right-hand bar of Gmail with information about the people who email you. Tweets, LinkedIn information and other social data is displayed, helping to provide a little more context to the messages you receive. We recently covered the company’s addition of the ability to reply to tweets and follow people on Twitter right from Gmail, and now Rapportive is extending its service beyond just received emails to ones you’re sending too. Once you’ve filled in an email address in the ‘To’ field, Rapportive will look up information about that person. While this might seem like a small change, it’s potentially very useful indeed. Being able to see a person’s latest tweets may give you information about whether now is a good time to contact them, or perhaps it will give you a good opening to your email: “I saw you’re in London today, how’s it going?”. If you haven’t contacted the person in a while, LinkedIn data might tell you that they’ve changed jobs – again, very useful to know to make sure what you send is a valuable as possible. The actual data you get for each person depends on what Rapportive has in its database, but when it’s good, it’s very good. The new feature is being rolled out to existing users gradually, or you can force an upgrade by visiting this link.